Discussion in 'Digital & Modeling Gear' started by aruark1, Apr 27, 2016. I have not used the Cube Street, but for $500 you could get a lot better speaker for your buck... Yamaha DXR, K10, etc. Are you playing out? Maybe you want a set of studio monitors? massless and aruark1 like this. Cube Street EX works well - remember its a versatile amp that can run 100% on battery power and can work as a PA, and takes DSP guitar modelers very well. the Speakers are very efficient, keeps up with a live drummer well and its stereo. yanakosk, rsm, aruark1 and 1 other person like this. Although I don't have a Helix, I do have a Cube Street EX, and occasionally use it with my Zoom G3 and Axe XL+. It is a cool little amp. I bought it because of the variety of inputs, on-amp level controls for all inputs, it's stereo, it does fairly well on batteries, and I figured it would also double as a stellar bluetooth or Chromecast Audio speaker if I wanted. In general, I do have somewhat of a difficult time getting a good eq. The stereo line inputs seem to lack some natural low end (although if you push low end content, it reproduces it quite well). The Mic or Guitar channels are only mono in, and don't really sound good at all with the G3 or Axe as a front end. There's also no gain knob....just some preset drive levels. Once the Line Ins are eq'd on the G3 or Axe end, they do sound pretty darn good to my ears..but I haven't tried an Alto. Elantric and aruark1 like this. Yeah the lack of gain is a head scratcher, especially since the regular Street cube has it. I think I just like the idea of having a stereo frfrish rig that can also be a backup, or standalone if I'm jamming acoustic or sans helix.... Also the battery thing would be cool and my micro cube was an energy efficient wonder! Honestly assuming the street ex would spend most time on 20 watt mode, maybe even eco. @Elantric if you build a patch in headphones do you find you're way off on the cube? Or is it just like any other powered frfr in terms of minor Fletcher Munson adjustments? FWIW, I also have a Microcube - and the amp voicing seems to be very different. As an example, I use some patches on my G3 into the Guitar input on the Microcube set to JC Clean. Those same patches into the Guitar input on the EX set to Clean sound astoundingly bad - thin and without body. Put into the Line Ins on the EX, and resetting the G3 to Direct (as opposed to Combo In), they sound much better/closer. I don't use the Aux in on the Microcube because of the lack of volume control, so I don't remember how it compares. Also, battery life on the EX is nowhere near as good as the Microcube, even on Eco. However, it is still quite a bit better than I would have imagined from AA batts. Without knowing, I would have guessed 'D' cells...but then again, I use it mostly at bedroom volumes. Or is it just like any other powered frfr in terms of minor Fletcher Munson adjustments? NamaEnsou, aruark1 and RafterRattler like this. Cube Street works well - remember its a versatile amp that can run 100% on battery power and can work as a PA, and takes DSP guitar modelers very well. the Speakers are very efficient, keeps up with a live drummer well and its stereo. How effective is the stereo in a live setting - do you get enough separation to hear the stereo effects? It works fine - but Who cares? - Its simply a stereo guitar stage monitor that can be standalone at small room gigs , but allows you to retain and use your stereo patches all the time, so you can retain stereo feed when you want to also feed the FOH PA, no need to change your Axe-FX patches to mono with resulting Stereo to mono phase cancellation issues. Its works fine - but Who cares? 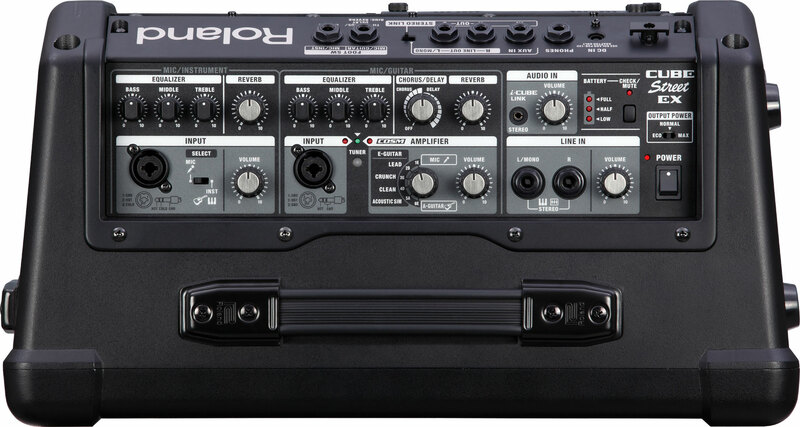 - Its simply a stereo guitar stage monitor that can be standalone at small room gigs , but allows you to retain and use your stereo patches all the time, so you can retain stereo feed when you want to also feed the FOH PA, no need to change your Axe-FX patches to mono with resulting Stereo to mono phase cancellation issues. I just love the idea of 16lbs, the option for battery, the backup basic modeling, and stereo. Also I bet it kills at campfires for mp3 playing... Damn you GAS! That it does....and like I said, it's nice that all the inputs have on-amp vol controls. Also, even though the gain knob is missing, the basic models are pretty nice. I actually love the lead tone. You're supposed to talk me off the cliff man, you're not helping! Crap. Wife is gonna be pissed. So I finally picked up a Street Cube EX. It is at least as loud as the Alto TS110 (at least for the volumes I play at), so that's nice. I think it sounds spectacular for clean tones, but whenever I try a distorted tone, it seems to get all honky and nasal. Any tips on setting the global EQ on the Helix to tame the honkiness?
. . . wait a minute - isn't this the "digital & modeling" forum ? Isn't this amp by itself a "modeler" . . . ? One of my rationalizations for picking it up is that I could use the amp modeling for a backup if my Helix ever crapped out on me. And it does sound really good for clean patches. For some reason, it just sounds very different when I'm playing dirt. I need to figure out how to tune that nasal frequency out.